15 Million Americans have food allergies and we crave a great dining experience just as much as our non-allergic friends and families do. Restaurants that "get it" and offer us a relaxing and safe dining experience will be rewarded with repeat business. Restaurant staff in all positions - front of the house, back of the house, bar - each member of the staff need to know how to avoid making guests with food allergies sick, or worse. Where can allergens hide? What are the differences between intolerance and allergies? What is the difference between cross-contaminiation and cross-contact? Foodservice East, a business publication for the Northeast foodservice industry, began in 1926 as Hotel & Restaurant News in Boston. Susan Holaday the current editor and publisher invited me to write this guest column on the topic of food allergies. I wrote this column as a risk assessment checklist. It includes ten ways to get it wrong and ten accompanying best practices. Click here to read the post: Foodservice East | News and information for the Northeast foodservice industry. Interested in a training or consult for your restaurant? I've designed a one hour session that can be delivered in a normal staff training hour or pre-meal meeting. I also offer a menu consult, and risk assessment. Email Me to learn more and to schedule a training for your staff. The thrill of travel is my siren song. I used to dream of filling a passport before it expired. Never happened, but I did manage to get to many great places. Machu Picchu, Xi'an, Tulum. Life can throw you one curveball after another, some good, some not so good. Layoffs, pink slips, food allergies. My high-flying life came to a decidedly more earthbound home. For several years I had time to travel but not the money. As we get older, we begin to appreciate that one is enhanced by the other. Fast-forward several years and I am slowly building an entrepreneur's life. This means we swing from one trapeze landing to another, sometimes the grip is so tenuous, the next check so long in coming. But we learn to live with the anxiety that would have done us in before and push on, move forward. Grab and let go. Let go, grab. This week I'm preparing for my first trip to Europe since my flight through de Gaulle to go to Mali but the last visit when I stayed and explored was a media trip to Valencia, Spain. That was wonderful, too. Both trips like evanescent dreams. Wonderful memories. I'm getting on a plane again 48 hours from this moment. I'm off to Brussels to work with the fabulous Nathan Fong on behalf of sustainable, delicious British Columbia seafood. After our success at Seafood Expo North America (#sena2014) - stir-frying with the Trade Minister! We're bringing the dynamic duo to the largest seafood expo in the world, Brussels! Now I'm dealing with multiple food allergies. Looking at the food there, dairy is definitely going to be a problem. I won't have time to shop all over and my Flemish is pretty weak. I think I've got this one down though: "Aangenamen Kennismaking" (Nice to meet you) it's just plain fun to say, isn't it? It's hard to explain to someone who doesn't have food allergies. But imagine you're somewhere unfamiliar, and you literally cannot risk eating food because you may end up in anaphylactic shock. And traveling in a professional capacity, you don't want to make every group meal a tiresome litany of your issue and allergies. "Who knows Flemish for 'allergy'?" Moules Frites? Waffles? (butter, dairy) Carbonnade? Waterzooi? (butter, cream) Food, glorious food. It's what I live for, what I organize my life around, what I share with friends, family and clients. But the prospect of being unable to find anything to eat made me realize I now have an extra list of travel prep tasks: researching, prepping, baking, planning. Even the flight to Belgium is a problem. Special diet meals include vegetarian (with cheese, nuts) Asian Vegetarian (may include dairy); Vegetarian (dairy). So what can I eat during the flight? Grab and go in the airport? Can you trust the labels on pre-packed foods? The fast food training? Erm, no. Basically, there was not one option that I could choose that was both free of dairy and free of tree nuts. Swiss International Airlines announced an "allergy friendly" service but to me it sounds like only a baby step further than what other airlines do. Chips? (made in a facility that also processes nuts) etc. It's impossible! Luckily, I'm a good cook. And I have good friends. And a very caring husband. He has turned into the best food sleuth! My goal was to find things easy to pack and dense with protein to keep me going in the worst case scenario. 1. Research, research, research. What are the typical foods in your destination? What capacity does your hotel have to accommodate your allergies? (Or even, to speak English?) Check with TSA and your airlines. 2. Pack pouches. Really good tuna, quinoa cereal, and terrific peanut butter all come in these easy-to-pack pouches. Thanks Doc! 3. Bake ahead. Energy Bites; Crackers, Apple-Quinoa Cake. 4. Try to order Allergy warning cards in the destination language. I ordered cards from Allergic Traveler - hope they'll arrive in time! The energy bites are great pre/post workout snacks. I love that they're not overly sweet and they're super easy to customize. This is based on Kim O'Donnel's original recipe from her Washington Post days. Her Lulu's Cookies became my Choco-fruit Energy Bites. Preheat oven to 350 degrees. Toast seeds on a baking sheet about 8 minutes, or until the seeds turn a golden color. Be careful not to burn seeds. Remove from oven and allow to cool thoroughly. In a large bowl, combine flour, oats, baking powder and salt. Soak dried fruit in hot water for about 15 minutes. Drain, but reserve soaking water. Add dried fruit soaking water to dry mixture, plus oil and honey. With a rubber spatula, stir until combined. Add cooled seeds and stir to combine, then add fruit and chocolate chips. Don't over-mix. Form teaspoon-sized patties onto a cookie sheet, preferably lined with parchment paper. Bake until golden brown, about 15 minutes. Don't over-bake; the cookies will turn into rocks. I love that these are like two bite energy bars without all the overly sweet, highly processed ingredients. These are like bites of shortbread chunks of sweet dried fruits and chocolate. What are your tips for traveling with food allergies or intolerances? Next up, the apple quinoa cake! I have a confession to make. I had all but forgotten my wok skills. I lost my wok in one of many moves. I settled in to married life steps from Chinatown’s Paifang (gate) and it just always seemed easier to go to a restaurant than to get another wok, season it, then chop, prep, clean. It wasn’t until I began guiding tours through Chinatown and launched my own cooking instruction business that I realized I needed to get back to actually cooking with a wok and teaching others to do so as well. I can’t tell you how pleased I am to be back at it. 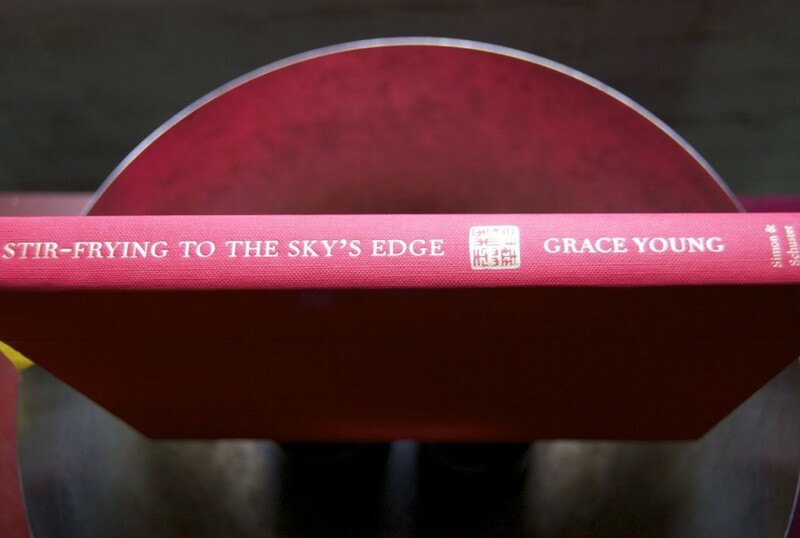 I have Grace Young’s brilliant Stir-Frying to the Sky’s Edge to thank for it. Click book to buy. Step One – How/where to buy a wok. For anyone near a Chinatown, you’re in luck. Many large suburbs also now have H-Marts or large cooking supply stores. I favor the lightweight, flat-bottomed carbon steel style wok. It cost me a whopping $11.98 at Sun Sun Market on Oxford Street. You can get a similar one online via Amazon or other such mail order shops. Even at double the price, it remains a bargain as far as cookware goes. Don’t bother to buy a nonstick wok! You will develop a natural nonstick surface quickly. Step Two – How to season your new wok. You’ll begin by scouring the wok with steel wool and soap. This is the one and only time these two things will touch your wok! You dry it carefully then season it by rubbing and pressing chopped scallion or garlic chives, ginger and peanut oil into the sides and bottom of the wok. After about 20 minutes of stir-frying the vegetables will be darkened and so will the wok. The pores of the wok have been opened by the heat and the metal will begin to absorb the fragranced oil. Step Three – Tips for excellent results. Throughout the book, you’ll learn tips and techniques like how to cut the garlic, scallion or ginger that make up Asian “mirepoix”. Helpful substitutions included for those not near a Chinatown. For example, dry sherry (or my mother-in-law’s favorite Amontillado) make good substitutes for Shao Hsing rice wine. Step Four – How to clean it and store your wok. Similar to cast iron skillets, you simply rinse with hot water, dry it, then store it. As mine is new, I often take a folded paper towel and tiny bit of oil or bacon fat to lightly coat the surface. Step Five – Unexpected wok fun. Did you know popping popcorn in a wok is one of the best ways to develop the patina? (See below.) With only 20 minutes, you can season a wok properly and then it’s DONE. Each subsequent use improves the quality of your wok. According to Grace Young, "Wok hei, or the breath of a wok, is the flavor and aroma that's produced if a stir-fry has been correctly cooked with super fresh ingredients over high heat---and it only lasts for a fleeting few seconds or minutes after the food has come out of the wok." I’d like to say I’m introducing a new technique and tool can energize your weeknight kitchen routine and inspire you to try new recipes. But in truth, wok cooking is as old as it gets. It may be new to you, but not for long. Recipes that are both pleasing and fun to make, as well as delicious. Like all my favorite cookbooks, this one is already dog-eared, splattered and tabbed. I removed the dust jacket for this shot. A seasoned wok is a work in progress, just like me. As I eagerly flipped through the first few pages of my then-new book with my then-new wok, imagine how my heart sank when I go to page 23 Patience to Wok. Patience? Me?! Only two pages later, I learn that one of my favorite snacks, popcorn, is perfect for boosting the wok’s patina. Like many kitchen lessons, these wok lessons translate to life lessons. Once in awhile, especially when your wok is young, you may find some food stubbornly sticking here or there. No problem! Woks, like cast iron skillets are nearly impossible to ruin. Young’s book even shows you how to give your wok a “facial” to restore the surface. Soon you’ll see beauty in your imperfectly mottled patina. You’ll appreciate the quick-to-heat and quick-to-cool surface and you’ll definitely appreciate the lightweight nature of most woks. I find myself reaching for the wok as much or more than the large cast iron skillet these days. Even eggs won’t stick now. Stubbornness of youth can be overcome with some seasoning. Be as quick to cool, as you are to heat. A tiny bit of TLC goes a very long way. Visit Grace Young’s site or join the #wokwednesday group on Twitter as they cook their way through the book! Grace recommends the Wokshop. Read more about Tane Ong Chan here. Want to learn to season and cook with a wok? Email me to set up a private cooking session. We will shop for the tools and ingredients, then season your wok and cook together. Let’s get stir-frying! Kinfolk Magazine sponsored a series of dinners in various cities in June. They called it the Butcher Block Workshop on Fish Cleaning; Charcuterie; and Butchery. I was thrilled to be invited to the one here in Boston at Beacon Hill Hotel & Bistro. I find Chef Josh Lewin to be one of the most thoughtful chefs around (much like his predecessor at BHHB, Jason Bond). These guys are what I most admire, first and foremost delicious food, the rest is secondary isn't it? Secondary, but not unimportant. Beyond delicious food, these chefs are quite studied. And, they are teachers, able to share, through their menus, and events like this, their knowledge. I always learn something new and taste something that is a revelation when I dine with Josh. So it was on this hot day in June. Through this event, we got learn about lamb, try our hand at certain cuts. We sampled a little simple piece of skirt, a butcher's cut on this size animal. It's hard to look at a whole animal, without its life, without its skin and to think of it as food. But it is food and we choose lamb that has been given a good life and hopefully met a good death. It is through the art of butchery that a life becomes food. I have great respect for this ancient art. The reverence for the life we're consuming is expressed at the Japanese table by the saying "Itadakimasu" - uttered before tucking into a meal. Often mistranslated as "Bon Appetit!" but it doesn't mean the same thing - at all. The Japanese custom is to give reverence for the thing that gave its life for your meal. I find butchering a quiet and peaceful act. I've not witnessed a killing beyond a lobster or an oyster, not sure I could. But I sure as hell respect it and wish more people did. Some find looking at this repugnant or difficult. It should not be easy. I find people who wrinkle their noses at food which reminds them it was once alive, more difficult than looking at the whole, skinned lamb. Baynatha Khubz wa Milah - a Jordanian phrase, if memory serves, roughly translates to "now that we have shared a meal, we are connected." A beautiful meal, a reverent experience of butchery, and a connection to food, to people I will not soon forget. Thanks to Kinfolk and to the Beacon Hill Hotel and Bistro for never ceasing to reveal something new in the every day experience of feeding ourselves and others. The notion of plant-based food being meals-minus-meat always rubs me the wrong way. Call me a glass-half-full omnivore. I've had my vegetarian phase and am now happily an eater of most everything. But the resistance of some to "give up meat" strikes me as fundamentally the wrong way to approach it. As a friend once put it "when someone hears I'm a vegetarian, they always frown and think how sad, imagining that I am eating buns without burgers or something." Listening to my friend Joe Yonan read from his new book Eat Your Vegetables the other night at Trident, I was struck again by how charming and thoughtful and funny he is. "Is it time to stop mocking mock meats?" he asks. And while his book buying fans, vegetarians and veg-curious, (some of whom went home empty handed due to a sold out inventory!) munched on kimchi deviled eggs (p.146) and poblano tapenade (p. 151) and chips, the reading was classic Joe: I had to take notes, I had questions, I was curious, I laughed. And that tapenade, sweetie, is to die for. The past week has been a tough one for us here, work challenges for both of us, sinusitis and migraine for me, anniversary of my late Grandmother's birthday, etc. (you don't want to know about the etc., trust me.) So we're looking forward to the holiday weekend even though I'll have to work. Try taking a day off when you're a loft-dwelling freelancer. Let me know how that works out. Yesterday evening was an example of why we, Me and Doc, work. How we work. In any relationship, clients, family, partners, you have moments when you are wise to hold your tongue and do the opposite of what you're feeling. Give rather than ask, compliment rather than criticize; after all this person at whom you may feel like lashing out against probably cares for you and probably is not intentionally being difficult. On good days, we can take a deep breath, a step back, and remind ourselves of that. On days when we've had crushing pain in our head for nearly two weeks, we can find that reservoir of kindness dry. "We" have been having that sort of time lately. Of course, I mean me. Digging deep, and feeling very sorry for Doc after a night of watching him clean up others' messes, all night, I decided to fill his cookie jar. This is a cookie jar I got for Doc for Christmas. Since I cannot afford the sorts of gifts he'd prefer (a new Land Rover, a Jaeger le Coultre watch) I have to go with more humble gifts. This is one of those. It reminds him that I love him. It reminds me that I don't have to do extravagant expensive things to make him happy. I can, in the simple gesture of filling a cookie jar, show him he is cared for. Yesterday, I thought he needed that. I made these cookies from Joe's great book. Carl's Chocolate Chunk Cookies comes with a headnote about caring for his then new boyfriend who was under the weather, first by making him soup, then by making him cookies. Who wouldn't feel better after that? Joe's lovely book is a reminder that food, whether it's meat centered or not, vegetable laden or not, free of mock meat or not, food is something we can use to comfort and value ourselves and others. As he reminds us, the seatbelt warnings on airplanes "place your own mask over your nose and mouth first..." we must care for ourselves first, then we're fortified and able to respond to the needs of others. Fill your own cookie jar! Doc came home with a surprise for me, too. A giant ciabatta from Panzano's - I immediately tore into it, sliced up a Purple Cherokee tomato and was in heaven. We take care of each other in these small but important ways. Because Joe has written "for the single cook", one might think the recipes are only for single cooks. Let me assure you this book is perfect for a couple as well. As many of us have come to find out, at a certain point, our weight does not respond the way it once did to simple interventions. I once used to eat anything I liked, in any quantity I wanted, and never gained an ounce. I have never forgiven my body for the betrayal of losing that capacity. As a cook, I find it hard to cook in smaller proportions and these recipes help. Make a couple of them for a small plates or tapas style dinner, or double one up for two, or add a salad or a grain. Do we really need two dozen or four dozen cookies all the time? Not always. Here we have ten perfect, giant cookies. A healthy, portion-controlled indulgence. Recipes that are straightforward, use simple ingredients and they work. They are also delicious. Headnotes and longer essays interspersed between recipes will have you nodding, laughing, and thinking. Particularly useful are the notes about scaling recipes, about using up ingredients, storing things. His relaxed manner should set even novice cooks at ease. Helpful sidebars throughout give even more advice to help you cook once, eat twice and so on. So I do urge you to Serve Yourself and to Eat Your Vegetables and to remember, if you're single and you don't value yourself enough to feed yourself well, don't you think that others will take their cue from that? Whether you're single or not, pick up one or both of Joe's books and I promise you, your cosmic cookie jar will overflow. Now, go forth and cook! As I began this, it was Monday June 24 and it was a true heat wave. While the mercury dropped some 30 degrees, it's inching back up again and we're looking for light and easy food for friends and family. Welcome to our virtual potluck, a wrap up of a Homemade Summer Solstice posts from all over: Holland to Oakland to Atlanta to Boston - and Japan! We're cooking from Yvette Van Boven's lovely and inviting book: Homemade Summer. Nearly every page of this book entices and engages. We either feel that we are, or know that we should be, in THAT photo, at THAT table. Thanks to Oof Verschuren's photography, I'm pining daily for summer picnics in Provençe! These are unfussy, easy recipes that deliver and beckon us to play, to relax, to eat and drink. We're not the only ones to take notice of this fine book. The New York Times, Food & Wine, Bon Appetit, Boston Globe, Providence Journal, USA Today, Washington Post, Huffington Post - just to name a few. I got the inspiration for a solstice-themed event from the indomitable Tammy Donroe author of Food on the Food. 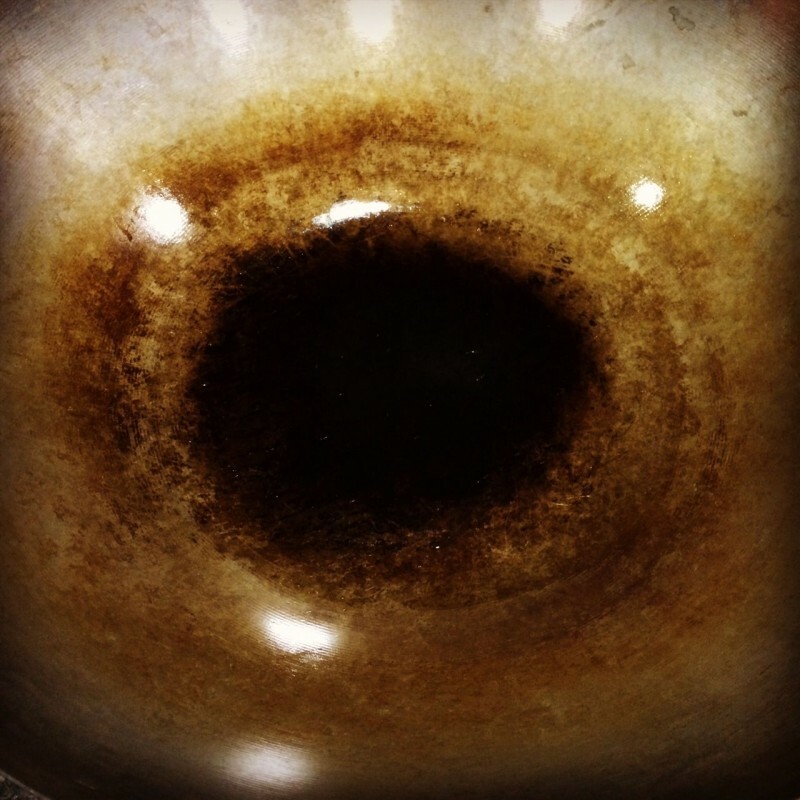 Tammy's blog is one I've read with both tears and laughter, always skewed more to the latter. Can't wait for her book this fall. (Winter desserts? Yes please!) Tammy hosted a giveaway of Homemade Summer and also made these lovely crab cakes to bring to our virtual potluck. Since my good friend Denise lives on the other side of the country, our visits are too few and too far between. But we always seem to pick up as if we'd just had coffee the day before. I wish we lived closer but given her considerable talents in the kitchen, my hips are grateful for the distance. Still, I'd walk a few more miles if meant we could dine together more often. For now, we will have to make do with occasional stolen moments during family visits and an online conversation that winds its way through the hills and valleys of our lives. She's one of those friends you can always count on and I think the first to say yes to this invitation, even though she was only hours back from vacation. Now that's a trouper! Check out her award-winning blog. She cooks, shoots, writes and eats accompanied by that delicious character she shares her life with: Laudalino - they inspire us at ChezUs.com. You know of my love for Maria Speck's Ancient Grains for Modern Meals. I even started the hashtag #Grainiacs because we have some momentum going with this grain thing owing in large measure to Maria. Her book is selling like whole grain hotcakes, as we knew it would. And even though Maria is at work on book number 2 (YAY!) she took the time to join our picnic, too. Let's celebrate her success with this lovely Cava Sangria, and let's toast her mother who taught her the value of delicious homemade food. The lovely (and lately glowing even more than usual) Shelby shares a beautiful post on the Strawberry Shortcake. I'm dying to try it now. Shelby is a food blogger, lover of Boston and New England, and works for a small indie publisher, Union Park Press. She's a fan of wine, beer and cheese and shared a beautiful sneak preview of a soon-to-come book you'll definitely be hearing more about here. A Dutch cookbook reviewer and blogger joined us, too! I'm so glad to see this Carrot Pie with Apple and Goat Cheese. You can find her on Twitter @DutchCookery. Peripatetic writer, travel host Gwen Pratesi (AKA Bunky) writes BunkyCooks and has transitioned from blogging to culinary travel and events. Alighting home in Atlanta between a Boston visit and her next trip, Gwen whipped up a lovely Mediterranean Salad with Spelt, Eggplant, Zucchini and Marinated Feta. Finally, I was intent on making these Fig Negroni Ice Pops from the moment I first laid eyes on this book. Negronis are one of my favorite drinks. This recipe is typical Yvette: familiar with an intriguing twist. I forgot about following directions and the importance of ratios of alcohol and freezing, but please do not let my refusal to follow instructions dissuade you from trying these. They are just delicious - promise. And here's a late entry from Japan - Thanks Tomomi! Or Domo Arigato Gozaimasu! Pink Grapefruit Tart. Penny Cherubino, publisher of BostonZest also loves Homemade Summer! There's a whole summer menu on Powells.com written, drawn, crafted by the multi-talented Yvette Van Boven. We begin with cocktails, here, an aperitif made with Aperol and bubbles..
You can create any menu you please, follow the one Yvette posted on Powell's or try ours here: It's a Summer Solstice Party - Homemade Summer Style. I like a meal with bookends, so my contribution to this party is Negroni Fig Ice Pops. Plus I have these cool Ice Pop Molds I wanted to use! Negronis are one of my favorite cocktails: gin, Campari, sweet vermouth - what's not to love? (try some Burlesque Bitters in your next one, or Orange Bitters, you'll thank me later). When I saw the recipe for popsicles that added figs to the mix, well, I was hooked. (just check the site header...) This is one of the hallmarks of Yvette's recipes, they're straightforward and yet always have a little surprise, a little something different. Figs complement the Negroni flavors beautifully. Put everything in a blender and blend until completely smooth. Pour through sieve into a bowl with spout and then pour into molds. Place in freezer and push wooden spoons in after two hours. Freeze for at least another four hours, but ideally for 1 day. Run the ice pops under hot running water for 3 seconds to unmold them. While the ice pops were freezing, I set up the photo cube and shot, planning to have a nice ice pop with maybe a tiny pool of melty goodness for some 'action' in the photo. So -- we cannot take issue with the recipe when we didn't follow it, can we? I used half a ruby red grapefruit (no oranges) and thought adding a couple dashes of orange bitters and a splash of orange flower water would add some orange notes to the pops. What I learned is the ratio of alcohol to juice is critical for proper freezing. Ultimately we enjoyed these from flutes with iced tea spoons. They were delicious. I'd make these again - and follow the recipe next time. The flavor was fantastic. This is the part of summer we love...you just look at the positive and roll with it. Now go enjoy! Inspired by Yvette's & Oof's gorgeous book Homemade Summer and Tammy Donroe's excellent suggestion, we've decided to do a Homemade Summer Solstice blog thing. I can't let go. I'm still getting books in bloggers' and food writers' hands - there's a small stack here with stickie notes indicating who I'm saving them for - you know who you are. We are inviting everyone who's got the book to prepare one of the lovely recipes (I'm thinking of the Fig Negroni Popsicles p. 99) and do a post. Send me the link on or before June 28 and I'll do a meta post (I know you're saying "that's just like her, she's so meta.") rolling up all the links to all your lovely posts in one. But wait, you say, isn't Summer Solstice today - June 21? Yes, of course you are correct. But you know we're rather fond of doing things on our own timetable around here. We're making our Solstice thing next Friday! Okay, but you're still so busy, you're wondering how you could possibly manage it? Let me tell you, I saw with my own eyes several of these recipes come together in 20 minutes, in one bowl, in one square foot of my kitchen island as I banged about testing the lamb, tenting it, carving it, dishing out sides, stacking pans...if you've seen me cook, you know what I'm talking about. I made us dinner while we prepped recipes for the various signings. Possibly there was wine involved, or whiskey, or both. Really, you can do this. And just think of the fun seeing all the summer posts in one. It may end up looking like the whole summer party menu Yvette did for Powell's. In fact, have a drink and relax. Why not a Pimm's Cup (p. 90)? Have a nibble on some crispy chickpeas (p. 111) or maybe shuck some oysters and enjoy with ginger lime dressing (p. 105). So that's it folks! Get your book, prepare something quick and delicious, post and send me the link by the 28th! This book figured into an almost mystical, years-long unfolding story of sushi, secrets, family and friends. I learned after the fact that June 18 is National Sushi Day. Someone once said "if she didn't have bad timing, she'd have none at all." This may be the best timing I've ever had. So let me take this timely opportunity to visit the book apart from my own story. First, let's address sustainability issues, after all part of how Marisa came to ask me for a jacket blurb was through my sustainable seafood writing. Tuna or No Tuna or ??? I was contemplating a second post on the tuna we used for the dinner anyway, but I figure now that folks might be searching for sushi at home tips - may as well post it now. If you love sushi, and whether or not you've tried to make it at home, I highly recommend this book. The author, Marisa Baggett is a pretty interesting character: an African American woman caterer from Mississippi who falls in love with sushi through a catering job, closes up shop, buys a one way ticket west to go to the California Sushi Academy and ends up publishing this book. I mean, who even ate sushi in Starkville, MS back then? On top of it, Marisa in true American fashion has taken sushi in slightly non-traditional directions. She not only encourages folks to riff on the classics, she gives great tips for incorporating local ingredients. She also focuses on sustainability, bringing us around to the issue of tuna. I stopped eating bluefin a while back. The population is so depleted, the only hope for its survival is careful management and probably a moratorium on them altogether. That's not likely but I personally do not feel it's ethical to keep eating them in light of the overwhelming data about the pressures on the stock. The good news is that you don't have to forego sushi. Bluefin was not always the most popular sushi choice, you know. In fact, Japanese used to bury it to lessen the bloody taste of it. Only now as demand for it worldwide has grown, and so the market opportunity in fishing it, have we seen such a crazy feeding frenzy for tuna. Read more about this once disparaged sushi choice by expert Trevor Corson. It's a fascinating bit of Sushi history that most people are largely unaware of. As with most of our food choices, conscious carnivores know that every choice, like our choice of tuna, carries consequences. In addition to the numbers, there's also the ways that tuna are caught (methods typically used now include unconscionable by-catch). If that wasn't enough, there's mercury which accumulates in unsafe amounts in these top-line predators. under the brand "Sushi at Home" which lists it's country of origin at Korea (likely the processor only.) Anyway, it was an interesting option to incorporate and I was pleased with the texture and quality. I've written to the company to see if they will provide more information. Presumably Whole Foods Market has done their homework as well. The other option now available here in Boston, is locally caught bluefin from Menemsha. I have mixed feelings about it, but I believe they're not using FADs and probably long lining or pole catching and limited in a way that's likely more regulated than the big international vessels. I'll drop an update here when I get more info on either the frozen or the fresh versions. In the opening pages Baggett lays out what you need to know about making sushi at home, including a forward by Trevor Corson, Getting Started covers the 8 basic types of sushi. Planning, an overview of the basic types of sushi and tools - each of these include photographs and helpful tips. Buying sushi ingredients includes a suggestion toward local ingredients and a small note about why bluefin tuna is omitted. Great Sauces and Condiments for Sushi, is followed by the first Chapter: Appetizers. Included here are Japanese classics as you might find in a restaurant, Age Dashi Tofu, Chicken Gyoza, Soba Salad, Tempura. Next is Sashimi including Poké, Oyster San Ten Mori, Tilapia, Tuna and Avocado tartar. Pressed, Gunkan and Nigiri sushi - includes Tuna Tataki among many others. One I'm dying to try is Avocado and Pomegranate Nigiri. Buttery avo and tart pomegranate sounds fantastic to me. Thin Rolls is next and includes some of the most interesting combos: Butternut squah rolls, Lamb rolls with mint, Roast Pork Rolls with Sweet Gingered Cherries. Catfish and peanuts, two additional Southern favorites - appear in separate Inside Out Rolls. Next up: Te Maki or Hand Rolls - Crispy Chicken Skin Hand Roll, Glazed Bacon Hand Roll, Coconut Shrimp...Kimchee, Tomato, Anchovy Hand Roll. The Spicy Calamari Te Maki looks divine. Desserts include plays on themes like chocolate Fudge Wontons and "Eggroll" Cherry Pies, cocktails and mocktails finish the book. A helpful Resources guide is included as well. This small book it packed with photos that enable even novice sushi fans to explore sushi at home, to get creative and to focus on local sustainable ingredients. Doing good tastes good. Sushi Secrets is published by Tuttle Publishing. It is available by clicking on the cover above through Powell's or at your local independent bookstore. You can also order it through Amazon. Get to know Marisa via her site: In the Kitchen with a Southern Sushi Chef. Sushi Secrets - What's a Little Spam Musubi between Friends? Rings Lost and Found. It all began with my Grandma. I went to visit her, in Hawaii the year before law school. She'd made a lunch of American cheese on white bread for her hapa granddaughter and I'd brought home a freshly grilled mackerel from the Japanese grocery. We had a good laugh and when she realized I loved Japanese food and flavors she asked me if I'd ever had sushi. At that point, I really hadn't -- save for a late night party in restaurant after closing hours. A female chef told me hilarious stories of trying to learn how to make this new thing called sushi from Japanese sushi chefs she could not understand. She'd carefully dropped each nigiri rice bed into a pot of water because she misunderstood their accent thinking the master had said "put them in water". What he had actually said was to put them "in order" (which, in a Japanese accent would sound nearly like "in water"). Sushi eating, much less making well, it was all so mysterious back then. Sushi bars were not yet fixtures in every city, every grocery store. It's possible the story was a little funnier because of the after-hours drinks but ... suffice to say I didn't really feel like I knew my way around a sushi menu from that drunken walk-in cooler introduction. Grandma took me to a local hotel sushi bar that happened to have an early bird special on sushi. I think it was some ridiculously good price for all you could eat sushi between certain hours. The sushi bar was tucked into an alley, between hotels and had all of five or so seats. In a city like Honolulu that caters to tourists, this was clearly a local hidden gem. She was delighted to watch as I ate my fill of this new treat. This was a fantastic visit and the only time she and I had had together, just the two of us. I will always remember how much I learned about her, and from her, during that week. We shared a love of travel and I admired her work part-time at a newspaper where the young staff valued her knowledge of kanji enabling her to typeset the printing plates with more accurate and nuanced vocabulary they did not possess. Before my arrival, she had saved some money to buy me a gift. She explained that she was afraid she didn't know me well enough to be confident she could buy me an appropriate gift. It had been years since we'd lived near each other in Hawaii, after all. The distance between 8 years old (when she brought me my first camera) or even 12 years old (when we left Hawaii) and law school, was great. I expected no gift but her company and the time with her so I was surprised when she gave me some money, explaining I was to buy something that I wanted. I'd noticed a small jewelers near the Japanese grocery where I picked that mackerel off the broiler/conveyer belt, still warm under its plastic. Something in the jewelry store window caught my eye. It seemed to me something solid would be a good way to mark this special week. I wanted to be able to look back and remember it with something tangible. I picked out a gold ring, easily the most valuable and extravagant thing I'd ever owned at that point. I thought about touching it in the future and remembering my grandmother and the special week we'd had - just the two of us - before I lost myself in law school, in practice, in life. When I showed her my purchase and thanked her for it, she did the über-Japanese thing, a small polite smile and a nod. "Grandma, do you like it?" "If it pleases you, then I'm happy." Well it does please me, though I don't wear gold that often anymore, I do wear it to remember her and to mark special occasions. As I became more immersed in Japanese food, and learned more about sustainable seafood issues, I developed a different sort of relationship with sushi. When Marisa Baggett asked me to provide a quote for her upcoming Sushi Secrets book, I was honored to do so. 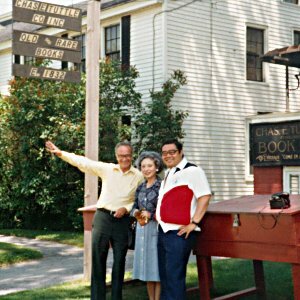 It was during this same trip to my grandmother's that I met Marisa's publisher Mr.Tuttle himself who would ultimately publish Marisa's book. Curious, yes? Here's his nephew who shared a snorkeling trip to Hanauma Bay with me, with Mr. and Mrs. Tuttle on the left. (She is from Hokkaido, just like my grandmother was!) They were very kind to me, inviting me to their hotel for an afternoon drink. Sustainable seafood and sushi are two passions Marisa and I share, in this book she skillfully combines them both. If you are aware of the growing scarcity of many species of fish, you may be inclined to forego sushi. Outside of a handful of Eco-conscious restaurants like Tataki and Miya's, you'd be hard pressed to find sustainability on the menu at most sushi bars you'll find. You can learn to make wise choices with the help of pocket guides and smart phone apps, but once you open your eyes to the depletion of our oceans, it's tougher to enjoy any old sushi joint. You can also learn to make sushi at home. If you don't think you can do it, I'm here to convince you otherwise. Marisa's book is a perfect guide. Just take a look at these kids making sushi in this video. When I got the chance to assist Chef Nathan Fong at the British Columbia Sustainable Seafood booth at the International Boston Seafood Show, I quickly said yes. Of course we didn't have any spam on the menu there, but do feast your eyes on some of the phenomenal food we put out for the show. My job was to shop, prep, assist, clean, etc. and I had friends who helped me schlep the groceries, lent me their carts, a bin, and so on. After the show was over, I wanted to thank my friends with a "Gokurosama Sushi Secrets" dinner. Gokurosama is the Japanese way of thanking someone for their effort. A funny thing happened while I was planning this dinner. A new couple moved in next door. I ran into them and invited them to come meet their neighbors and have some sushi, warning them that it was a bit of a crazy menu and crazier crew. Turns out Cody and Carlos were engaged and we all fell in love with them. Cody had some hidden sushi ninja skills and brought the star power that only a former child TV star can bring. She also brought a charming Bolivian, now her husband, and a bottle of Prosecco. We were smitten. We made sushi together, using Marisa's excellent book. Here's Cody showing two Chinese girls, Lisa and Jesse, how to make rice for sushi - in the microwave. That's Carlos on the left checking out the recipe. Here's our disappearing Spam Musubi. Cody's hidden talent, at least one of them, is making these. In just a few short months, we've become so close and shared (some might say overshared) so much. We even got invited to their wedding. I'll not steal their thunder but I will share one little secret. I wore my gold ring, purchased to commemorate my special week with Grandma, to this weekend wedding in the Berkshires. And promptly lost it. I searched everywhere and could not find it. I kept it to myself, sharing the secret only with Doc, in case it might feel like a bad omen or something. I thought about my Grandma and that week and focused on the important things: one, the memory and not the ring is what's important; two, there was the most uplifting wedding going on where gold rings were being exchanged to signify Cody and Carlos' commitment. This was a joyous weekend and the only tears were happy tears. On checking out, I quietly left a request to the staff that if the ring should turn up, it be returned to me. I was pretty certain it was gone. And during this weekend I had hoped to actually write about this first night we met Cody and Carlos over Sushi Secrets. I thought it would be a fun post for folks to see just after the wedding. But it wasn't happening. There were drinks, and laughs, and friends. There were tears of joy, new friends, and more laughter. And there was this gorgeous wedding between two really sweet new friends going down. So the post, I decided, could wait. And in a moment in a hammock with my (city boy) husband, I remarked how things that seemed urgent before, suddenly felt less so now. Being in the moment is a lesson I seem to need to learn over and over again. Cody and Carlos did exchange their rings, after a lovely "ring warming" where the rings are passed from guest to guest, during the ceremony imbuing them with all our best wishes for a lifetime of joy. I was sad about the ring I lost, but so very happy for these wonderful people and their marriage, that the sting of my loss was diminished. Such is the power of love. Sushi is not a meal you would typically make at home, especially in the U.S. where we have a penchant for quick "3o minute meals" and we're mad for shortcuts. These notions are the opposite of how the Japanese approach, well, almost ANYTHING. However, Marisa does a great job of laying out step-by-step instructions, photos and recipes making the job of rolling or pressing sushi eminently doable. As with any cooking, it pays to plan ahead and think about what you'll be preparing. In this case, I was celebrating my friends and showcasing fantastic seafood from British Columbia. So I had some prep to do: Dashi, tempura sauce, sweetened soy and spicy mayo, as well as rice soaking/steaming. All recipes are clearly laid out in simple instructions, and many have step-by-step pictures. My plan was to have drinks, introduce the concept of the evening, and introduce friends to each other while we nibbled a bit of the sablefish stir-fry. Then, I figured we would not be starving and could begin trying our hand at making sushi, following the various recipes. We began with Spam Musubi partly because it was a quick one to put together. There's also nothing like sharing something as retro as Spam to break the ice. I had the table set with Lisa's special sushi plates, dipping sauce dishes, new fancy chopsticks for everyone to take home, and of course, drinks! We prepped and cooked, and rolled, and pressed. Ikura, uni "gunkan" or battleship style sushi. Tamago in front, garnished with Northern Divine Caviar. tuna, avocado, nori and my crazily tabbed book. I never planned on being married, myself. So I never had a fantasy about "the ring." Caleb changed that and showed me, shows me every day actually, the value of the commitment it symbolizes. Cody showed me her ring and how proud she is to have incorporated design elements from her beloved Mother's ring into her own. We held their rings and wished good things for them and were buoyed by the love that swirled around us all weekend. We're so happy to have such great neighbors we can count as friends, like family really. We've already shared so much including this first raucous sushi feast. As we unpacked from the weekend wedding and began to plan our week ahead and to think about the work to be completed Sunday night, I found in my suitcase the ring I was so sure I'd lost! This whole story, my sushi discovery, meeting Mr. Tuttle, choosing a ring to mark my time with Grandma, developing an awareness of and appreciation for sustainable seafood, gaining such solid friends and sharing their wedding with them, losing and then ultimately finding my ring...rediscovering how joy supplants sadness...it all creates a perfect circle. I tend to learn in rather deliberate if not dramatic ways, don't you think? My Grandma's presence is certainly here in this story. Life can bring you friends and connections that might take years to mature, as with my Tuttle connection; or in the case of our friendships here, they might deepen very quickly. Joy shared openly can diminish loss. People who matter are with us in our hearts even if no tangible thing remains to remind us. As always, there is joy in sharing a meal with friends and with some attention to what we eat, we can revel in food even while being mindful of our impact on the planet. With some thoughtful care for friends and partners, we can and will share many more meals together. With Baggett's Sushi Secrets they might even be homemade, sustainable sushi. Congratulations to Cody & Carlos on their marriage. Congratulations to Marisa Baggett on this beautiful book. May we all eat well and remember the words we Japanese say before consuming our meal: "Itadakimasu" which is to humbly receive the lives given so that we may eat. A fitting pause before a sushi meal. With the summer solstice nearly upon us, it's time to get together and celebrate Homemade-style! Come pick up your own copy of Yvette Van Boven's acclaimed book: Homemade Summer. We'll have a glass of wine and catch up. We'll plan our summer solstice blog party and we'll toast Tammy Donroe for the excellent inspiration! Thanks to Les Zygomates for hosting and Kitchenwares for goodies! RSVP to me here - just a few seats left. 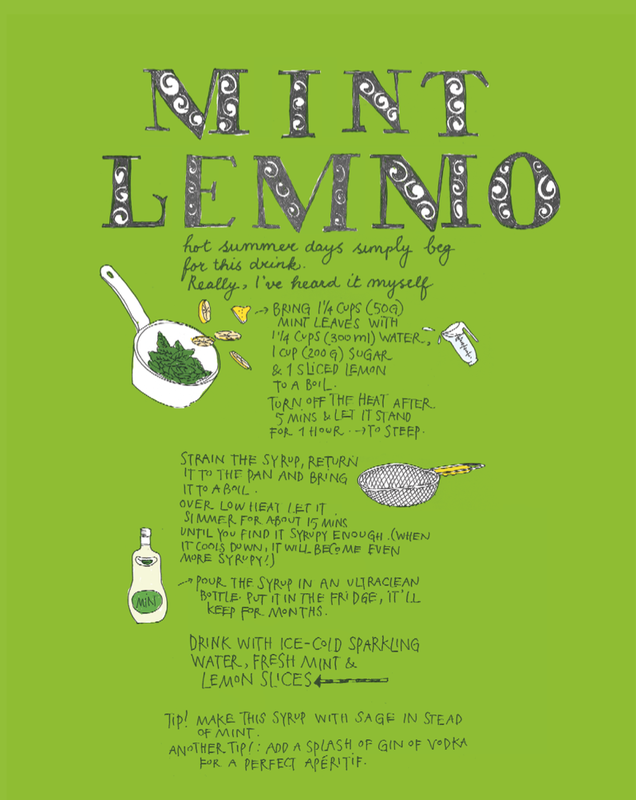 In celebration of the warm weather (don't worry we're losing it soon enough) I decided to make a batch of Mint Lemmo. It's already gone. I want to make more and try it with elderflower liquor and a couple blueberries...and gin. Today's was Lillet Blanc, splash and soda water. As we round out Yvette's Boston tour, making lists of last minute logistics and details, we dip again and again into this beautiful book. "Her cookbooks give the reader a sense of a life well-lived and the abundant joy delicious meals offer when shared with friends and loved ones." And Food & Wine who interviewed Yvette to get an insider's tour of Amsterdam, drawing on both her design background and her restaurant/catering/cookbook experience. "...the cultural poverty it (simultaneous closing of top two museums) created stimulated an underground scene that was really approachable and fresh.” Read on to learn about this "punk food movement" in Amsterdam. April 13 @ 12 -2 have lunch with Yvette at the ICA on Saturday - check with Eat Boutique here. April 13 @ 4 - Brookline BookSmith - tasting and chat. April 16 @ 12-2 - Media Luncheon - chefs at Les Zygomates will be cooking from the book! Bonus: her award-winning photographer and husband Oof Verschuren is coming, too! If you were thinking about joining us and decided against it, you might be kicking yourself about now. It was a stellar gathering of friends from near and far - many in town for the International Boston Seafood Show. The Oyster Century Club shared stories of oysters up and down the East coast and West, tales from the seafood show, and tips on pairing, tasting, and more. We had several friends from Sewansecott Oysters, Shooting Point Oyster Company, Martin Reed Captain of I Love Blue Sea and crew (Matt, Rocky & Danielle), consultant Emma McLaren, Justin of Northern Divine brought some fabulous caviar we tasted on some West coast oysters, and then, on our hands, of course. Duff Hu of Best Honour International Seafood (that's some fabulous geoduck!) was there, too. We even had a world class shucker, author and publican in our midst: Patrick McMurray (aka Shucker Paddy) and his man from Ceili Cottage ("Kay-lee") it's Irish, and they've got a Yurt in Toronto. Not making it up. Our hometown representation held up honorably by none other than the wonderful Patrick Maguire of jm curley and I'm your server, not your servant fame. Good craic as they say, eh? Sounds Like Fun - How Do I get Some of That? Now, if you're wondering what the heck the Oyster Century Club is, we're a group of hedonists tasting our way through a hundred varieties of oysters. We mark our efforts on our tasting sheets (get your very own here) and we meet up occasionally at favorite oyster bars like Les Zygomates. To host the Oyster Century Club's next Tweetup or if you want to sponsor our adventure and stake a claim in our hearts forever (and get on the radar of oyster lovers near and far) email me here. I'm also available to do an Oyster 101 class at your next team training or event. Saying goodbye as we schlepp our wares out the last day. Then a feast at Jade Garden including fantastic geoduck, fish maw soup, scallops with vermicelli and toasted garlic and so - much - more. What a pleasure it was sharing the delicious variety of sustainable seafood coming out of British Columbia! All agreed it was a successful show. Thousands of samples served. Deals done. Relationships built. Looking forward to next year already. Shop, Prep, Repeat. Getting Ready for the IBSS 2013 and Seafood 24/7. Snow, high winds, flight delays, missing shipments, three-wheeled carts...nothing stopped us from getting it done. Top row, L to R: Snow falling in front of the Chinatown gate, snow at South Station, Snow on Beach St., a cart that caused Chinese cashier to say "too much." Second row, L to R: Groceries, squeeze bottles, astro turf, materials. Third row, L to R; Empty Convention Ctr day before 18K people descend; plows outside Convention Ctr; Snow; Registration done. Last row, L to R; Checking the booth set up, MacGyvered a "vacuum"; the prepped and cleaned "kitchen"; all veg, washed, peeled, prepped. Missing picture: the cart that lost a wheel! Top row, L to R: a shot of the show floor; filleting a fish; French scrambled eggs with Northern Divine Caviar; Uni & Ikura on Koda Farms heirloom varietal rice. Second row, L to R: sockeye salmon corn dogs, sockeye fried rice with ikura; Chefs Fong, Duarte, and me; Justin Henry of Northern Divine. Third row, L to R: Fanny Bay oysters (and my coffee, of course); the "kitchen"; oyster chowder; Justin and Nathan. Last row, L to R: Chef Fong with sockeye salmon in tomato-citrus ceviche; waiting for a cab to the Consulate event, BC wine (tasty! ); and Oysters (of course). I am a big fan of hostess gifts, convenience, whole grains, and real food. Can these all be combined? Yes! I am also a big fan of waffles (remember Happy Shiny Waffles and Sunday memories imprinted with a waffle-patterned perfection?) I am delighted to share a recipe that I promise you'll turn to again and again. I think it would make a perfect Christmas morning breakfast. It would be great to bring to a friend or family member. And, trust me, it's fantastic to have on on hand. Maybe you're thinking "Grains" means dinner and "Mains" certainly leads us in that direction. But why should breakfast be left out? Anyway, haven't you heard of chicken and waffles? In this new book Grain Mains: 101 Surprising and Satisfying Whole Grain Recipes for Every Meal of the Day, you can indeed find "main course" recipes for breakfast lunch and dinner. I have tried their barley risotto (even with non-dairy substitutions, it was great) and the recipe I'm sharing here is one I think is a great seasonal, convenience: waffle mix! Bruce Weinstein and Mark Scarbrough are two of the founding members of the Goaterie. If you're at all curious about exploring the most popular red meat eaten around the world, do have a look at Goat: Meat, Milk, Cheese. Award-winning, prolific, funny, these guys have their finger on the pulse of the food zeitgeist and they can turn out a cookbook as quickly as some of us take to decide what's for dinner. In fact, these guys are so prolific they probably will have another book or two done during the time it's taken me to write this review. This book (click on the cover to buy it now) is well designed for anyone looking to incorporate more grains into their diet. If you don't know your farro from your freekeh, this will give you a good "grains 101" including the difference between various grains and the forms each grain might take on your grocer's shelf. Helpful tables and photos enable you to determine which grains benefit from an overnight soak, which recipes can be made in the event you forgot to soak anything, and substitutions and suggestions accompany most recipes. 1. Four Star Farms - Their Triticale berries and wheat flours are superior. The Triticale berries cook up so quickly and are so tender, you'll want to add them to many dishes. 2. Koda Farms - best brown rice (Mark Bittman says "probably the best produced in the U.S." - I agree) and beautiful heirloom varietal Japanese white rice which nothing else compares to. 3. Eden Foods - These bags of quick cooking whole grain flakes can be hard to find in groceries. Luckily, they're easy to buy online. I use the Kamut in my DIY granola, recently called "beguiling" (blushing). 4. Bluebird Grain Farms - another family farm I love. Their Emmer Farro is fantastic. Whisk in 1 large egg, 1/2 C + 1 TBSP milk (whole, 2% or even fat-free - I used soy), 1/2 tsp vanilla extract and 2 TBSP walnut oil (could also use hazelnut or pecan) or 2 1/2 TBSP melted and cooled unsalted butter. Mix well and set aside for 10 minutes while the waffle iron heats. Then make waffles per iron manufacturer's instructions.To make pancakes, thin with additional milk, 1/4 C or so. Those pale waffles (above) were a fleeting thing. The waffle iron - which was a lovely surprise that made me SO happy, briefly - had an annoying habit of walking off its perch atop the fridge. Waffle irons are not meant to tumble. We'll be in search of a new waffle iron after the holidays...any recommendations? I want nice dark, crisp waffles. We are in full swing now with our beloved bi-valves coming into the season of their peak deliciousness. We certainly enjoyed plenty of oysters this summer, but every ostreaphile knows that oysters begin storing glycogen for their winter slumber. This means they are extra plump and sweet now and through the winter months. I've added one or two new varieties to my tasting tally, how about you? I'm hovering right around 45 or so varieties tasted. As this is a rolling marathon, new people joining all the time, I'm ever-vigilant for new ways to keep this enticing and fun. Stay tuned for coming announcements and new sponsors. Today, we're announcing two very special prizes. For one special member we have a fantastic and timely prize. A $50 gift certificate at Kitchenwares gourmet shop! What could be better as we enter the holidays? Newbury Street's premier culinary resource for home gourmets & professional chefs. Offering customers the kitchen tools & accessories for preparing great food & culinary experiences in their home or on the job. KitchenWares by Blackstones • 215 Newbury Street, Boston, MA 02116 • (857) 366 4237. Stop in and see them on the Newbury Street Stroll, Dec. 8th! You can also follow KitchenWares on Twitter @Kitchenwares. To Claim: If you have tasted 50 varieties, drop a comment here letting us know. Email me a photo of your tasting sheet. If more than one member has achieved this feat, I'll use the random number generator to select a winner. I'm also very excited to share this prize for one lucky member who's reached 25 varieties tasted. You know I've been making mignonettes with my Katz vinegar and have loved these products for years. Katz is my favorite source for truly artisanal vinegars. I first tasted their Gravenstein Apple Cider vinegar at the Slow Food conference in San Francisco years ago. One sip and I was hooked! I used the Sparkling Wine vinegar just the other night in my mignonette for a half dozen Lucky Lime oysters from PEI. A bit of minced shallot, couple splashes of this elegant vinegar, sprinkle of sugar and grind of black pepper. Absolutely perfect mignonette! Others in my rotation now include: Trio Red wine vinegar and Viognier Honey vinegar (perfect on roasted winter vegetables). The gift box contains three of Katz' vinegars, personally selected by Albert Katz to complement oysters! If you've tasted 25 varieties or more, drop a comment and let us know! Email me a picture of your tasting sheet and you will be entered to win. If more than one member has achieved this feat, I'll use the random number generator to select a winner. You can follow Katz and Co on Twitter @KatzFarm. Warm thanks to our sponsors and good luck on your win!